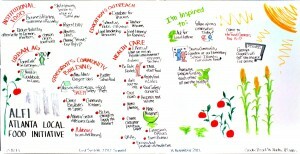 “Atlanta Local Food Initiative.” Atlanta Local Food. Atlanta Local Food Initiative, 2013. Web. 27 Mar. 2016. <http://www.atlantalocalfood.org>. This website, created by the Atlanta Local Food Initiative, gives information about what they do to impact their community. ALFI is a “diverse coalition of stakeholders working to build a more sustainable food system for metro Atlanta” (Atlanta Local Food Initiative). Coalition meetings are held every other month, and those involved in the ALFI like communities within Atlanta, nonprofits, universities, government agencies, individuals and corporations participate in these meetings. They have organized public speaking events to raise awareness for the challenges of food systems in Atlanta and all over the world. 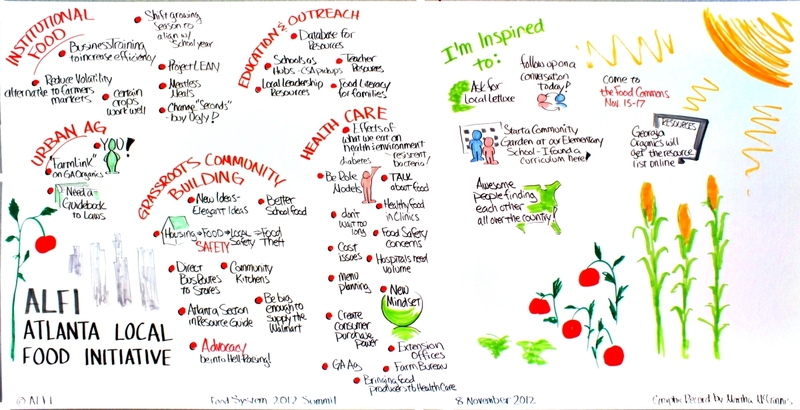 This particular event was the Food System Summit in 2012 at the Atlanta Botanical Garden. The following image is one that they used during the event. The website can be a tool for me to explore how ALFI’s methods of getting involved are making an impact on the communities that they touch. I will analyze the methods of public speaking, the competitions they are involved in with the amount of local food grown, and their other methods of spreading this local food movement. “Hunger in America Study 2014.” ACFB RSS. Atlanta Community Food Bank, n.d. Web. 25 Mar. 2016. <http://acfb.org/facts-stats>. This article by the Atlanta Community Food Bank has many statistics from 2014 about families that rely on the food bank temporarily or for many years. According to the article, every year 1 in 7.5 people around Atlanta and north Georgia rely on food pantries and meal service programs to feed themselves and their families. Additionally, more than half of the households relying on this food bank make less than $1000 dollars a month. Prasertong, Anjali. 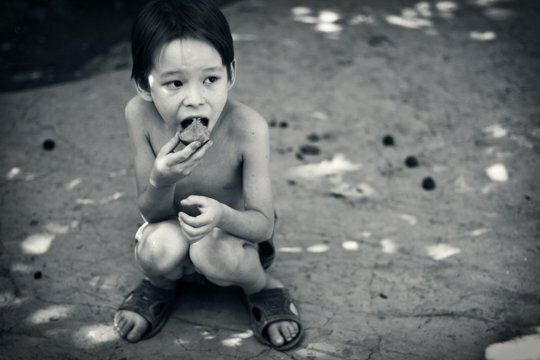 “The Dark Side of Summer: Children & Summer Hunger.” The Kitchn, 26 July 2013. Web. 27 Mar. 2016. <http://www.thekitchn.com/the-dark-side-of-summer-children-hunger-192701>. Additionally, they mention that those surveyed confess that they have had to chose to eat inexpensive, unhealthy foods because that is the only thing that they can afford. Many people do not support government programs like this because they think that the people relying on them use it as a crutch. They say that now they are getting free or discounted food, they can stop looking for a job and can rely on the government for sustenance. However this article addresses this thinking by including the statistic that 59% of the families served by the ACFB have been employed in the past year. This article can be an important point in my analyzation by having the facts at my fingertips.